On 19-20 February 2010 massive communal attack on Jumma villages was made by military forces and Bengali settlers at Baghaihat area of Sajek union under Baghaichari upazila in Rangamati district. It is reported that at 8 Jumma villagers including a woman were killed and 25 Jumma villagers wounded in this attack. It is learnt that around 200 houses of Jumma villagers including Buddhist temple and church were completely burnt into ashes. On 19 February 2010 afternoon a group Bengali settlers went to the Gangaran Duar area and put pillars on the land of indigenous Jumma villagers for construction of house there. At that time, the Jumma villagers protested and opposed the Bengali settlers. Again at night around 8.30 pm hundreds of Bengali settlers led by leaders of so-called Sama Odhikar Andolon under full protection by a group of army from Baghaihat zone of 8 Bir Bengal gathered at Gangaram Duar area and started to set fire on the houses of Jumma villages. At that time, at least 35 houses including 7 shops, a church and a UNDP-run village centre, in three Jumma villages of Gangaram Duar, Chaminichara and Baluchara were burnt down. Jumma villagers alleged that Bengali settlers also looted the valuables while they were burning the houses. The villagers fled into the jungle when the attack took place. After the first attack, the villagers returned to their villages the next morning and gathered in Gangaram to protest it. The Bengali settlers returned in the morning on 20 February 2010 equipped with sharp weapons, machetes and sticks. Further, at around 10.00 am on 20 February 2010 tension mounted throughout the area while the army and Bengali settlers ordered the Jumma villagers to leave the area, but they refused to comply. At around 10.00 am the army started to beat the Jumma indiscriminately. One Jumma villager chopped an army named Rezaul while beating him brutally and then the army fired leaving him spot dead. Following this, the army opened fire into the Jumma villagers indiscriminately without any sort of provocation, leaving at least 8 dead and 25 wounded. They army also arrested three persons from there. Since the start of firing, Bengali settlers with the help of army set fire on Jumma houses at Hajachhara, Guchchha Gram, Balughat, Simanachhara, Baipaichhara, Suranganala and Kerekkaba villages. It is reported that at least another 160 houses were torched at that time. Bengali settlers also burnt Banani Bana Vihar, a Buddhist temple. The monk of the vihara Ven. Purnabas Bhikkhu, fled the temple without taking meal. One statue of Buddha was looted and another one which was given by Thai government was looted. As they continued the arson attacks, the indigenous community began resisting them. During this resistance, six indigenous persons were injured. 5) Mr. Nutunjoy Chakma (28) s/o unknown of Golakmachara. 8) Mr. Prem Lal Chakma (26) s/o unknown of Chaminichara. It is learnt that the dead body of Buddhabati Chakma was brought at Baghaichari police station for postmortem. But dead bodies of other deceased are yet to be recovered. On 20 February 2010 afternoon the army imposed section 144 in the area to prevent Jumma villagers from taking out protest demonstrations. Bangladesh military forces undertook plan to settle down the infiltrated Bengali families along the roadsides of Sajek road from Baghaichari to Gangaram Mukh in 2005. It is also mentionable that thousands of indigenous Jumma families have been living in this area for decades long. Hence, Jumma villagers of these areas have been protesting against this illegal settlement programme. Despites the protesting, in 2008 Bengali settlers illegally constructed some houses at Gangaram area on the land owned by Jumma villagers. At a stage on 20 April 2008 the Bengali settlers with the direct support of army of Baghaihat zone attacked on the 7 villages of indigenous Jumma peoples and at least 76 houses of indigenous villagers were completely burnt to ashes. Again, since starting of January 2010, Bengali settlers with the support of Baghaihat army zone resumed expansion of their settlement in Sajek area under Baghaichari upazila in Rangamati district. A number of houses have already been erected by the Bengali settlers occupying Jumma villagers’ land. The villagers, under the banner of Sajek Bhumi Rakkha Committee, submitted a memorandum to the Baghaichhari UNO on 10 January 2010 with an ultimatum of 16 January 2010 to return them their lands. As the deadline expired without any fruitful result on 16 January, Jumma villagers started their agitation and started to boycott Baghaihat market from 18 January 2010. On the other, on 25 January 2010 the PCJSS sent a letter to the Home Minister with copy to State Minister of CHT Affairs Ministry and other concerned government authorities demanding to stop settlement prgramme and to withdraw Bengali settlers from Baghaihat area. However, government did not take any measure in this regard. It is reported that most of news media primarily reported fabricated news. For example, the Daily Star in its internet edition on 20 February mentioned headline of news as “Criminal killed in gunfight with security forces in Rangamati”. However, it replaced later with “2 indigenous men killed as troops open fire in Rangamati”. The Prothom Alo stated it as firing between Paharis and Bangalis. Most of the electronic media aired news in favour of Bengali settlers. Most of the media reflected statement of military authority as well as administration that went against the Jumma peoples. Processions have been brought in Rangamati, Khagrachari and Dhaka protesting against the attack. At 11.00 am on 20 February 2010 PCJSS brought out procession in Rangamati. PCJSS claimed that Bengali settlers led by so-called Sama Odhikar Andolon (a fanatic organisation of Bengali settlers) and Parbatya Bangali Chhatra Parishad torched the houses of the tribal people in a pre-planned way. On the other, Pahari Chatra Parishad (Hill Students Council) also brought out procession at Dhaka University campus in Dhaka. A gang of thugs attacked Rema Amit, 26, and a friend who was in his company. The spoils of harvest is a phone and 70 cents. Police have already identified and arrested the members of the group. Dhaka (AsiaNews) - An armed gang has killed one tribal Christian student and injured a friend, to steal a phone and a tally of less than one euro. The two young men were on their way home from festivities for the 100th anniversary of St Joseph's Catholic Church, located in the district of Netrokona - Dhaka Division - about 173 km from the capital. The police confirmed the identification and arrest of all members of the group involved in the murder. 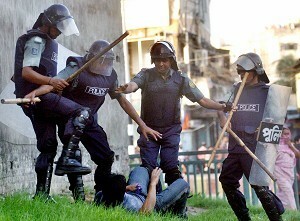 The incident occurred on 15 February in Mohammadupur, division of Dhaka. Rema Amit, 26, a student of the Institute of Science and Technology at Dhanmondi in the company of his friend Sohag, had just got off the bus, returning from the festivities for the Jubilee of St. Joseph Church. On the wayhome, in East Raja Bazar (Dhaka), the two friends were attacked by a group armed with knives and pistols, who ordered them to hand over money and valuables. At the young men’s refusal, the assailants struck them with a large knife and then stole their money which amounted to a total of 70 taka (about 70 euro cents) and their mobile phones. Sohag, the survivor, said that "the group followed us, in a private car" and attacked them "near Amit’s home." A police patrol on the spot immediately intervened arresting one of the assailants, Sujan (aka Monir) 24, who was in possession of a large knife. A few hours later the agents stopped the three other members of the gang, Habib, 24, Ershad alias Munna, 26, and Monirul, 25, seizing a pistol and ammunition.